Continuing the recap of the recent WRRI conference, Dr. Mike Mallin of my alma mater UNC-W presented his research titled “Onset of Unprecedented Toxic Cyanobacteria Blooms in the Cape Fear River”. In it, he highlighted troubling trends on the Cape Fear River. First, nutrient levels have been steadily increasing since the mid-1990’s. Of the four stations he highlighted, ammonia trends had risen between 64% and 315% since 1995. While NC does not regulate ammonia levels, it does have standards for chlorophyll a (40μg/L) which can feed off nutrients like those in ammonia. Since 2009, chlorophyll levels in the lower Cape Fear have been found to be exceeding that standard with one surface sample exceeding (1440 μg/L). Yikes! Second, toxic algae levels were found to be high. Toxic algae can cause rashes to exposed skin and, if ingested, disrupt the nervous system, or worse. 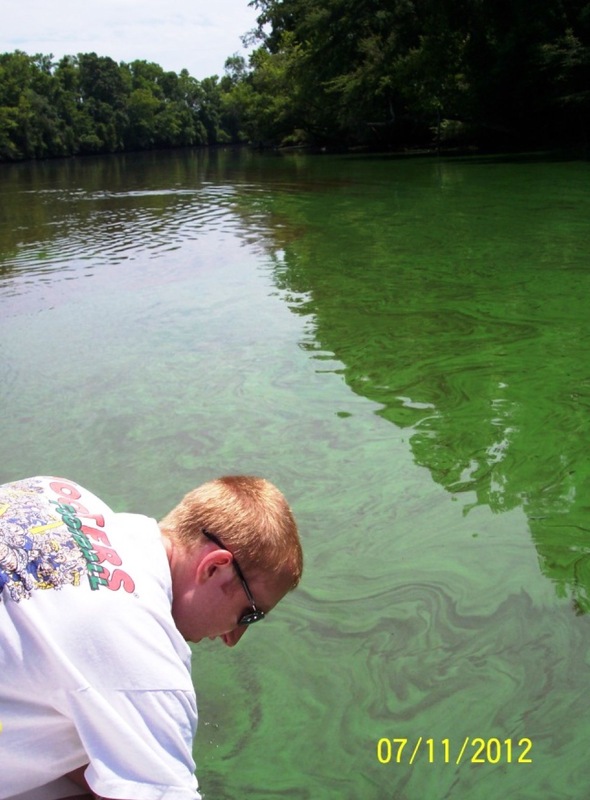 One Cape Fear reading for toxic algae had levels 75 times higher than the World Health Organizations standard of 1μg/L. Double Yikes!! Image courtesy of Dr. Mike Mallin. Algal bloom in lower NC’s Cape Fear River. Some of the concerns over these results are obvious: wildlife are threatened and human recreation in areas experiencing these blooms should be avoided. Another serious concern is that Wilmington draws much of its water from the affected waters, contributing to increased water treatment costs and creating taste and odor problems in the City’s drinking water – a problem highlighted by Michael Richardson recently at NC’s forum on nutrient overenrichment. The expansion and increased severity of nutrient related water quality problems in the state is presenting a challenge to the State regulatory agencies. I’ll post more on this theme soon.